Key to success of large-scale project is meticulously designed plan and process, unequivocal roles and responsibilities, and cross-functional communication to accommodate changes and issues arising on a daily basis. Our professionals with long-standing project experiences facilitate every aspect of project to run the project smoothly and lead the projects in a harmonized manner. Our expertise extends across multiple industries; Finance (Core banking, Treasury and Capital Markets), Trading, Leasing, and Manufacturing. Combining the expertise with our PMO services and IT Consulting, the project enjoy profound insights into business issues and practical solutions. Dedicated IFRS consulting group to address the specific risk, regulatory, operational, accounts and IT systems as per clients’ needs . IFRS consulting group, helps to design end to end process to ensure IFRS solutions implementation with minimal impact to existing system and business. People: ICAEW (IFRS) Certified Professionals with dedicated IFRS consulting and solution team. 150+ committed team members with various roles as project managers, consultants, business analysts, software developers and testers working on various risk and compliance projects. Experience: 100+ successful implementations of risk and compliance solutions (including IFRS) for Japanese top banks and Tier-1 regional retail & corporate banks, investment banks and other financial institutions. Approach: Work closely with Risk, Financial and Information Technology team to have clear understanding of IFRS Models and System Environment. 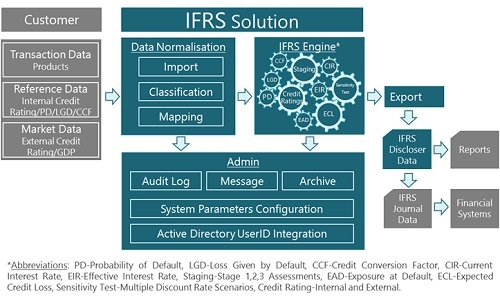 Solution: State-of-the-Art robust “IFRS Engine” designed to support various IFRS requirements (Classifications, Staging, Impairments and Disclosures) in more reliable, accurate calculations and flexible report generation with system interface modules. Module driven solution approach provides flexibility to accommodate feature requirements. Coverage: State-of-the-Art robust “IFRS Engine” designed with to support various IFRS requirements in more reliable, accurate calculations, flexible report generation and easy to establish interface with other systems. This is the Contract Origination System that supports a compendium of products from quotation, simulation, and application. The portfolio of products include finance lease, operating lease, hire purchase, installment sales, equipment vendor programs, corporate loans, syndicate loans, Revolving credit loans, stocking loan, account receivable loan, and risk participation/guarantee. Contract Management sub-system manages the contract terms and conditions, collateral, guarantees, vehicle equipment information, repayment schedule, payment instructions, ex-ante and ex-post contract document tracking, Contract approval, and Contract activation. It supports Agreement, Letters, Instructions and Notices. Corporate treasurer manages fixed deposits, bank credit facilities (long, short and project), bank borrowings, cash projection, and interest rate hedging activities using interest rate swaps, currency swaps, swaptions, caps, floors, and forwards. This includes repetitive activities such as Rental/Installment Invoicing, and Overdue Interest and Late Fee Invoicing, interest rate reset for floating rate transactions, insurance management, and license renewal. In addition, it supports contract early or partial terminations, delinquency management, recovery and repossession, as problem customer management. Marketing and treasury data flows seamlessly to the financial accounting sub-system. Apart from the daily journal entries activities, the system supports month end closing, year end closing, asset management, accrual for interest income, rental income, commitment fees, interest expenses, exposure management and reporting, financial statements and reports. It also supports group consolidation when the system is setup for multi-company operations. 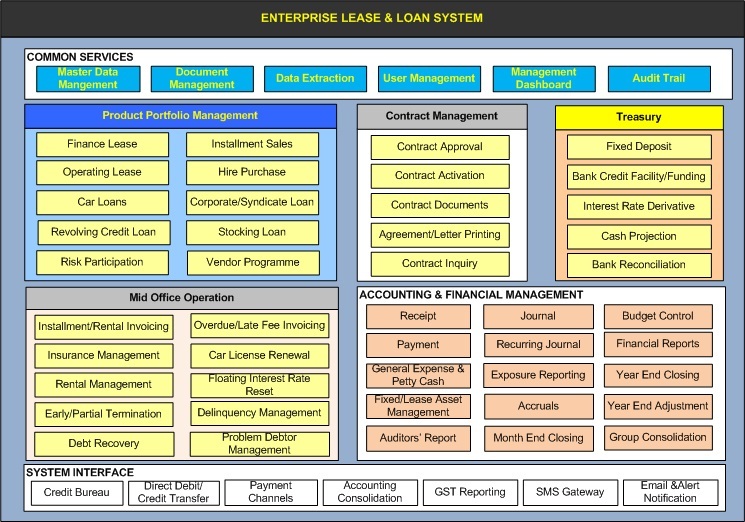 Built over the years the system has rich external system interfaces with Credit Bureau, Banks (Direct Debit/Credit Transfer such as GIRO and AutoPay), Payment Channels (AXS, and PPS), Industry sharing entities, accounting consolidation software (STRAVIS), GST Reporting, SMS Gateways, and Alert and Email Notification interfaces. Build very accurate predictive models using more than one thousand of built-in models with minimal data science knowledge. Massively cut down on the time to build and deploy custom models and organizations to scale modelling operations. Provide data-driven insights to better understand what specific factors drive outcomes and how they improve operational results. 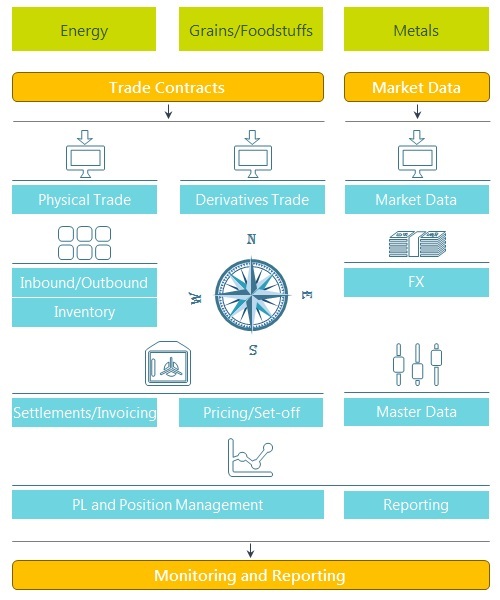 Supports physical commodities trading such as fixed price trade, premium trade, and lease trade of physical commodities, associated with hedge trade such as listed trades and OTC trades. For managing actual stocks in warehouses, our solution supports management of goods received (inbound), goods delivered (outbound), goods reallocated, and list of goods in stock. Provides booking functions of purchases, sales inventory, direct buy/sell, transfer from unreceived goods, balance settlement, adjusted goods transactions, particular charges, and issuing invoices. Provides calculation of P/L and position such as volume position, premium position, spread position, FX position, and realized P/L. Controls risks in a timely manner with market data simulation, factor analysis, and Value at Risk calculation.